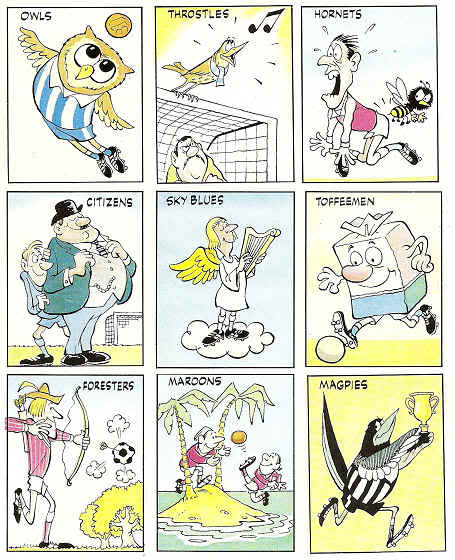 Ever wondered why Everton are called "The Toffees", Newcastle the "Magpies" or Chelsea "The Pensioners" ???? Well, this site will try explain the whys, what, who and when behind the sometimes baffling world of football nicknames, sometimes of course the true origins have been lost in time and only myths remain., in those cases we will try to differentiate between fact and fantasy. Then again sometimes the origin of a football teams nickname is so obvious it doesnt really need an explanation but that still doesnt stop the history of them being fascinating, apart from the obvious boring ones - which I wont mention to save offending anyone. a: A descriptive name added to or replacing the actual name of a person, place, or thing. b: A familiar or shortened form of a proper name. Given the above definition though its easy to see why the likes of Tottenham (Spurs), Hartlepool (Pool) and Bristol Rovers (Rovers) got their nicknames. However, its harder to work out how some nicknames fall under that definition, for example surely only a fan of Lincoln would know why they were known as The Red Imps? The answer of course being a combination of the colour of their strips and the fact that an Imp statue sits on top of Lincoln cathedral !! The colour of strips has also featured in some of the more bizarre nicknames as well, one of the more extreme ones being Lancaster City who are known as The Dolly Blues because they used to play in the same colour as Dolly Blue washing tablets !! Not all football teams actually use their nicknames in any sort of official capacity but some have been known to go over the top in claiming "ownership" of their nickname. These teams will remain nameless to save me getting into trouble but suffice to say the team concerned have actually taken people to court for using a nickname that had grown from supporter use but had nothing to do with the club until they realised its worth on their official merchandise !! Anyway, enough of that sort of thing, this site is purely about giving football fans a bit of background to their teams nickname and how they came about, hopefully it will give you a bit of info you didnt already know and maybe clear up a bit of the mystery surrounding football nicknames and their history. It is a brand new site which is very much a "work in progress" which will be updated as and when we can so if your team isnt listed yet please dont think "fancy not having my team, what a rubbish site" as we will get round to listing them all in time - of course if you want to drop us a mail with your team Nicknames background we will gladly stick it on here for you, saves us doing the work !!! In the meantime we have shown a few cartoons below portraying some of the teams featured on the site, wonder how many you can name ?? ?